It is this year the centenary anniversary of the elevation of Cardinal Sarto to the Supreme Pontificate. 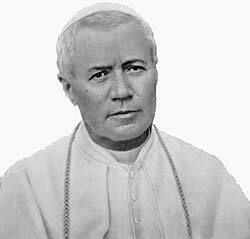 Cardinal Sarto, who was patriarch of Venice, was elected as Pope Pius X on the 4th of August 1903. His elevation was, and still is, a true gift of God. And why do I say this? By the events in the world, history shows us that mankind has degenerated at an alarming pace in the last few centuries. God in His mercy, sent us His Son through His servant, St. Margaret Mary Alacoque, giving to the world His most Sacred Heart, begging men to return to Him. Man would not listen. Then again, through His infinite mercy, God sent His Mother to cry over nations at La Salette. Again man turned a deaf ear. Knowing that He would now punish the world by leaving man to his own devices, God gave us a gift by whom those who would still seek to love and serve Him, would be guided through these troubled times. This gift from God’s infinite love was St. Pius X. Shortly before his pontificate, Modernism, which became the true scourge of mankind, raised its ugly head through a French priest by the name of Alfred Loisy. By his penetrating analysis, Pope Pius X clearly saw and understood this great heresy. In 1907 he wrote one of the greatest encyclicals that ever came from Rome, Pascendi Dominici Gregis, against modernism. Ever so old yet ever so new, this encyclical became for us a beacon, a light shining in the darkness. Would we have ever seen the errors of today if this great Pope had not traced them out so clearly? Perhaps like sheep, all going astray, we would never even have seen the errors of today. They are even espoused by the pinnacle of the Church. After all, were we not always taught to listen and obey the Church? Who would have dared to stand up against St. Peter as did St. Paul? Archbishop Lefebvre used to tell us how he was taught in the French seminary to see clearly the errors of today by studying these great encyclicals of the popes. It is not only his encyclical against modernism which has cast such a bright light in the darkness of today, but also his other writings. E Supremi Apostolatus on the importance of knowing our faith, Ad diem illum, an encyclical treating the subject of Our Lady, mediatrix of all graces, Jucunda Sane, in which he reminds the heads of state of their responsibility before God. For us priests, how beautiful is his letter Haerent Animo. It is a letter that can be read over and over again, reminding us of the Church’s need of holy priests. Let children, and we were once too, be deeply grateful to Pope St. Pius X for his ruling that they be allowed to receive Our Lord at an age of innocence. Oh that modern seminaries, which have become nothing less than dens of the anti-Christ, may read and follow the instruction laid out in Doctoris Angelici, in which he exhorts that Philosophy and Theology be based on the teachings of St. Thomas Aquinas.